Calling all superheroes, supervillains, and helpless citizens (those not in costume)! Join us for this year’s superheroes versus villains themed 5K run/walk. Upon registration you will receive a Super-Shirt, swag bags, and your designated bib with your number. Snacks will be provided. For those interested a free health screening will be available that includes: functional movement screening, vitals and BMI. 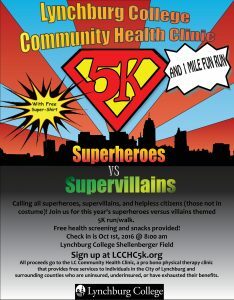 The purpose of this 5k is to raise funds for the LC Community Health Clinic, a pro bono physical therapy clinic that provides free services to individuals in the City of Lynchburg and surrounding counties who are uninsured, underinsured, or have exhausted their physical therapy benefits for the year.